Growing up I was always taught there were 5 senses. You can see why it came as a complete shock when I learned that there is actually so much more to our sensory system. That is why I am excited to join with my friends at The Inspired Treehouse, a group of pediatric physical and occupational therapists, to bring you this series on all things Sensory Processing. 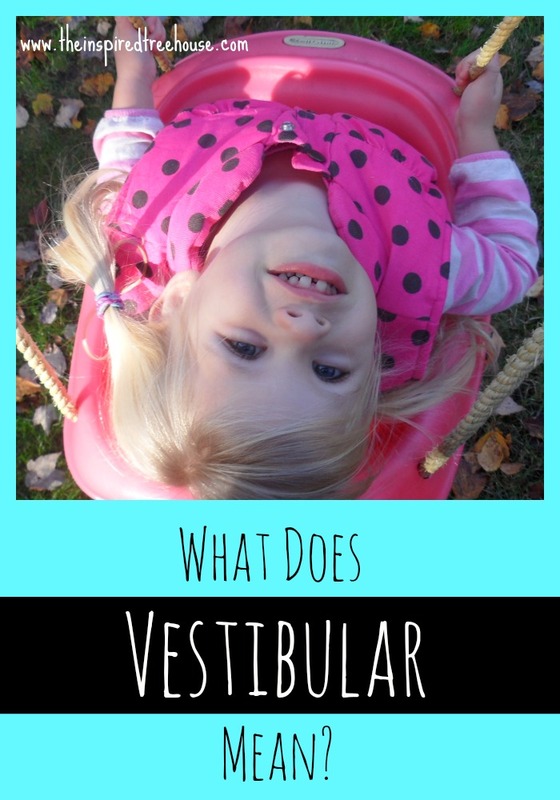 This month we are talking about Vestibular Input and its importance for growth and development in kids. 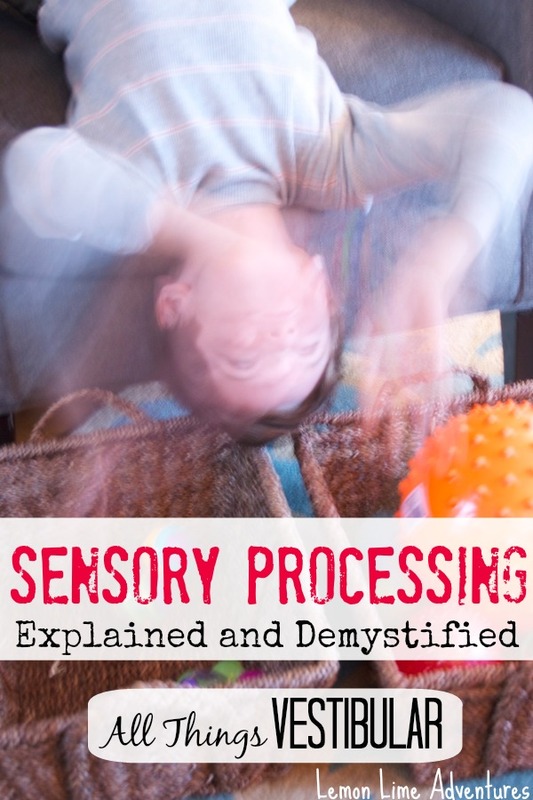 Just like in the last post, I will attempt to explain an aspect of Sensory Processing from my perspective. I will not attempt to use medical terms, explain what I don’t understand myself, or pretend to be an expert. My good friends, at The Inspired Treehouse, will bring you their take on the same topic, giving you a better understanding of Sensory Processing. Vestibular just sounds weird. Its scary and intimidating. In fact, when I found out that this was the next post in our series about Sensory Processing, I was scared myself. I wasn’t sure how I was going to present this information to you, so that it could be less scary. If I had to define the Vestibular System without using medical terms, I would define it as our ability, desire, or avoidance to move through space. Spinning, Turning, Flipping, Climbing… these are all vestibular activities. If I have learned one thing about Vestibular development, it’s that it is not just important to understand for children with Sensory Processing Disorder, but for all children, as they learn to make sense of the world around them and learn to move through their environment. According to The Out Of Sync Child Has Fun, Vestibular Input “coordinates movements of the eyes, head and body” which affects our body’s balance, muscle tone, visual-spatial perception, auditory-language perception and emotional security. As I mentioned before, Vestibular is all about balance and movement. All children require this movement and input for proper development. The problem occurs when a child is either over or under responsive to this input. As an educator, I remember being so confused by some children’s inability to attend to a lesson without bouncing, fidgeting or rocking. I remember one student who fell out of his seat on a regular basis, despite all attempts to help him “sit correctly”. I’ve also seen the opposite end of the stick.. the kids that refused to play freeze dance, that were hesitant to take risks and were sedentary (almost “lazy” if you didn’t know better). No one ever taught be about this system when I was an educator. It wasn’t until my own son started getting older and it was no longer age appropriate to spin in circles when he was being talked to, that I realized I needed to learn more. In my home, it is not unheard of for Legoman to dig his head into the ground and spin in circles. If we are trying to talk about something of importance, this just escalates. Impulse control is something that we struggle with on a daily basis here, and until we started receiving therapy for his sensory needs, it was downright scary. I have very vivid memories of the times that other people were hurt because he was unable to control the impulsive habits. I used to pass off his impulsiveness as a behavior issue. My problem. I used to beat myself up about the kind of parent I was. To give you an idea of the types of danger I am talking about, let me share a few of the incidents that have been burned in my memory banks. There was the time he turned on the lawn mower when his dad was fixing it, or the time he stepped on the golf cart peddle and ran into his aunt, or how about the time he pushed his brother off the top of the slide without realizing he had done it. Every time, he felt awful. Every time, he didn’t even know it had happened. Remember, Sensory Processing is Complex. It is different for every child, because every child is unique. 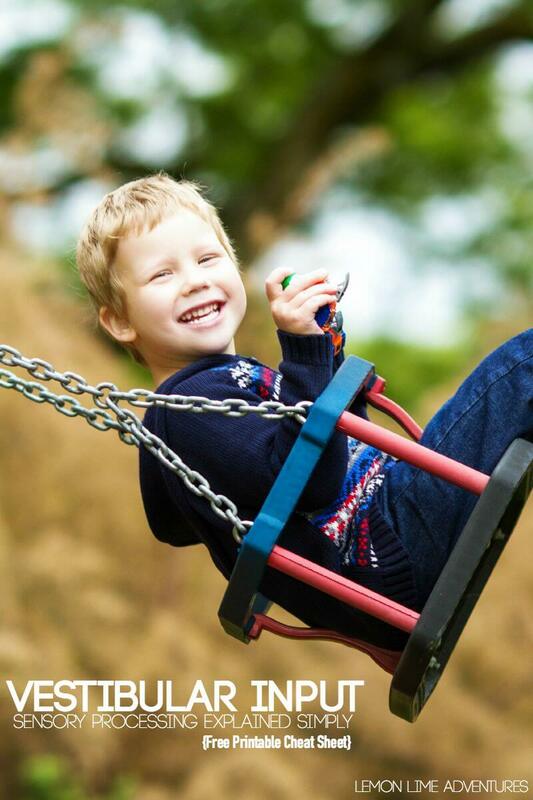 The problems arise when a child either seeks or avoids vestibular input. 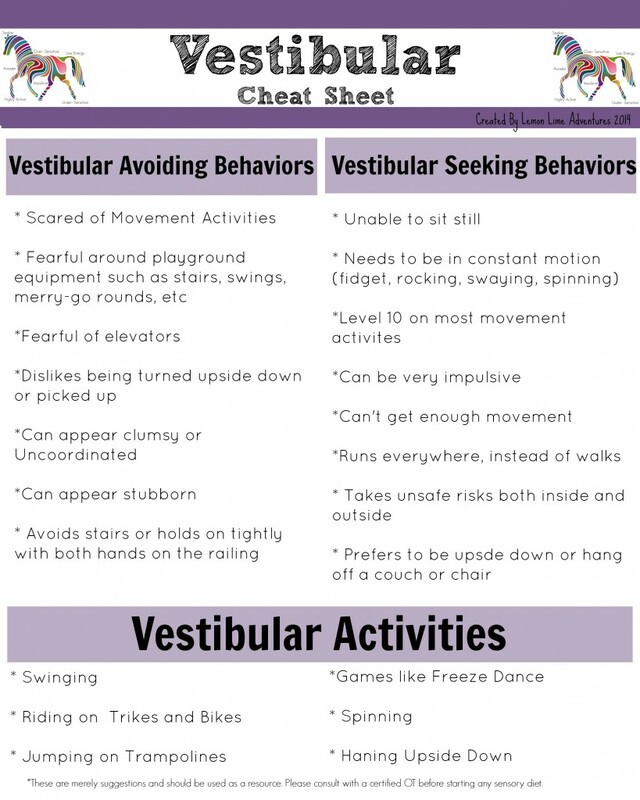 For your convenience, I have compiled a Vestibular Cheat Sheet listing behaviors you might see if your child is with avoiding or seeking this type of movement. Now its time to hop over to my good friends at The Inspired Treehouse, where they are sharing their tips as Pediatric therapists to explain Vestibular Activities and why they are important to the growth and development of all children. Dyan at And Next Comes L has created an amazing swing made from a woven wrap, which is great for providing vestibular input. Your Therapy Source has printable Vestibular and Movement Cards that are great for the classroom or at home. Movement in the classroom is easy, with these easy tips from Your Therapy Source. I love this Gross Motor Sensory Play from Little Bins for Little Hands to encourage vestibular and proprioceptive input. 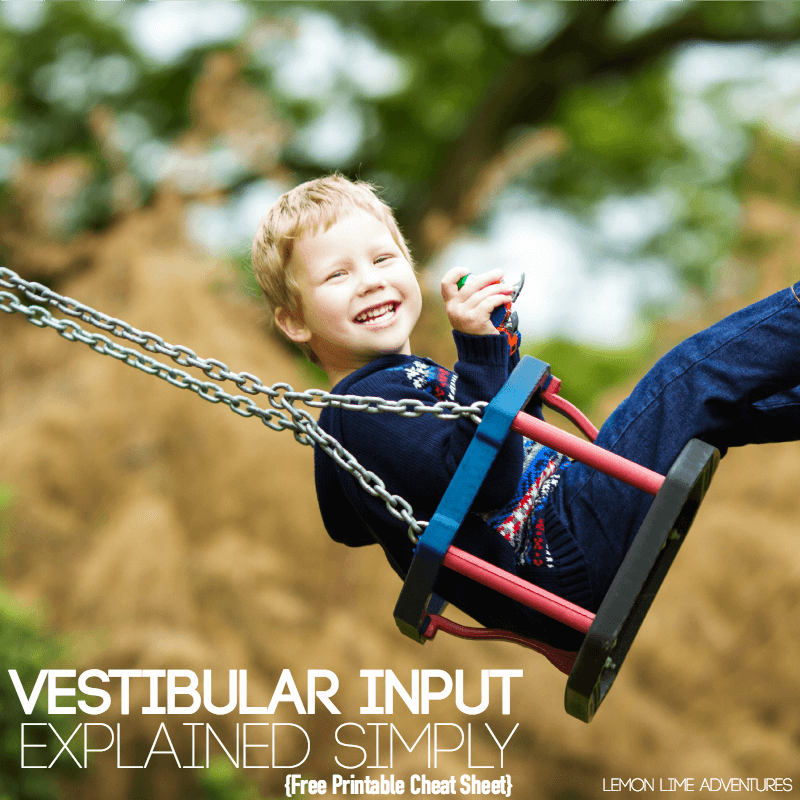 Do you know a child that seeks or avoids vestibular input? Do you have a child with sensory needs? Has this post touched you in some way? I would love to know! Please send me a message or leave a comment. It helps when we know we are not alone. Click the picture below to join our Support Group for Sensory Needs. Follow Lemon Lime Adventures’s board Sensory Play on Pinterest. UPDATE!!!!!!! This and Many More Cheat Sheets are Available in my new book, Sensory Processing 101! 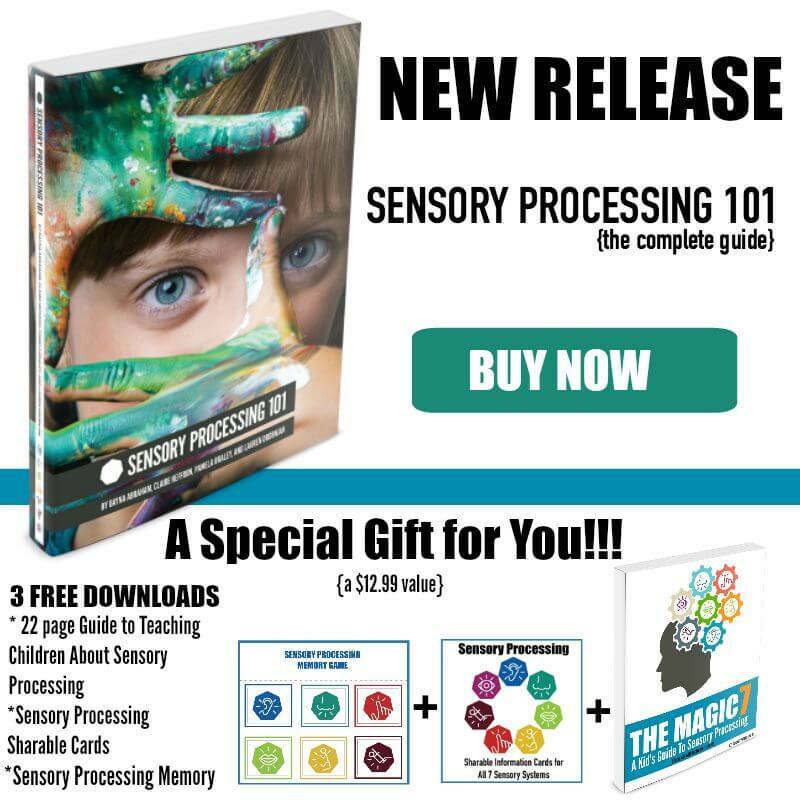 Just released, Sensory Processing 101 is already being called “the sensory bible” and “an invaluable complete resource for anyone that interacts with children.” For a limited time, you can get the PDF version along with three free gifts! This is very eye opening for me…I’ve seen it in a lot of kids, but didn’t have a name for it. Even as a children’s mental health therapist, we weren’t taught much about sensory disorders….which is weird to me. That was 10 years ago, and we know so much more about it now. Thanks so much for this series, Dayna. I’m glad to have a resource like this to help explain some of my kiddo’s needs, since I tend to struggle with finding the right words. My boy is extremely under-responsive to vestibular input. It’s difficult sometimes, I feel, to find a good balance in knowing he NEEDS to move and trying to figure out how to guide him to understanding that it sometimes isn’t appropriate. When I look back, I feel like this was the very first sign that something wasn’t quite the same with him. As a baby he spent HOURS each day in his swing, unhappy to be anywhere else but in that thing on its fastest speed. Ah, Yes… Recently I have been looking at old videos and old photos and realizing that there were needs all along that I never recognized. I blamed myself for a very long time and tried each and every teacher trick I knew. I am so happy this was helpful to you and I hope you will join the group of parents and educators in the support group! Thank you so much for this! My toddler has sensory processing disorder, and it is frustrating that there is not a lot of information out there about it. I hope people will become aware of what this looks like through posts and information such as this! I am an OT and love this post. I cover this briefly on my blog, but LOVE all the attention you are giving to it. We can do so much more for our kids with this kind of knowledge. Thank you so much for your support. It means a ton to me that you think that I presented this information effectively. Great summary… Thank you so much! I’ve shared it with our family to help explain a bit more about my oldest daughter. Ry has actually tested imbalanced on the vestibular charts… In that, one Side of her brain is requesting more input while the other is requesting left at the same time. Obviously, this complicates things immensely. Our therapy focuses on strengthening both sides so that there will be less of an imbalance and less emotional struggle while dealing with regular life. This post is awesome, thanks! My son is a vestibular avoider to a T. Slowly making progress in that area with OT and PT. Mine is a vestibular seeker and actually will turn upside down and dig his head in the ground and turn circles. I am so happy this has been helpful to you! Do you know what an obsession for hugging people can mean sensory wise? Please and thx! This sounds like it could be proprioceptive seeking behaviour? Dayna, saw this linked on FB. Great stuff! I edit a newsletter for Amish and Mennonite adoptive/foster families. Most of them do not have internet access. I would love to share this info with them as it is something that gets requested. Wonderful. Where did you see this linked so I can thank them? My son has spd, of course no Dr. has diagnosed him but I have done alot of research myself and on top of this he has been diagnosed as profoundly deaf. I am really struggling with knowing how to help him. Please help! I am so sorry. It is a struggle as a parent to not know where to turn. I have been there and still am some days. One of the best things I have found is a support group I started on Facebook If you click through the picture in this post you can ask to join. The other parents and educators are amazingly supportive! Your response touched me as we have been in a similar situation, not knowing where to turn. We now have an OT working with us, and have found some teachers to be really supportive. The highly Sensitive Child was a really helpful book for me too. I have three boys who all have elements of SPD, one quite significantly. It is a difficult road but it can get better. Wishing you all the luck and strength in the world. I can not thank you enough for your article presented in this manner. I will totally be able to present this as a introduction to a conversation with my husband. The presentation is amazing, informative and not to long. I could have written it to him with a title of ”A Description of Our Daughter, Things I Need You to Hear that I’ve Been Trying to Say”…. but that’s the thing!–I can’t get it all clear and together. And keep my worry, judgement or doubt of myself etc etc , out of the way long enough and hold true to it tight enough in order to help us all! Even the comments from others are words right from mouth. I hope this will open his heart to heal and accept. A small part of the problem is my kids are each very different, all seek and avoid different things and at different times, but are on the higher functioning side. So I think it’s easier for him to say or give all the regular things like–oh its a phase, they’re just kids, they need different disciple techniques. etc. While those are all very valid points, finally a piece of my heart is exposed within this article. I know I am not crazy and I know they have other beautiful characteristics that make them unique, smart, wonderful and most lovable at times. But also they are loud and exhausting and constant and have at times taught me more about so many things in the world than I ever knew before them or would not have known without them! I also know those characteristics need to recognized acknowledge and even celebrated. They are real, they deserve attention. That I have to find a way to be the best Mom for them and give them more than I had and understood. So that they can feel safe within themselves, proud of their motivations and actions that guide them and to be strong enough to know when to stand firm and when to bend. And to know that either is ok. To know that their voices are heard and their paths are designed to bring them one step closer to the next adventure! That is my hope for them…I know a lot of this in my soul because I see myself and feel myself with in their struggles. Or is it me projecting….dang let me re-read this, LOL….thanks again!! My son is vestibular seeking a thousand percent. He has OT, does therapeutic listening and it helps. His OT describes it as being upside down, spinning, jumping ect makes him feel normal. He is 4 years old and very active. He started doing full on cartwheels at 2 years old. He has tremendous body control and awareness. Along with this he also has auditory comprehension issues. Other than TL is there something I can be doing as a parent to help with that? We have pictures for most everything. If I show him a picture or how/what to do, he can do it. If I verbalize it, he is lost. He also cannot seem to dial in when being spoken to……Is there something as a parent I can do to work with him on that? He use to have night terrors regularly but since TL that is gone. He has improved GREATLY! I just want to give him the most I possibly can. It all seems to do with ears and some eyes. Too much noise/loud crowds of people/too many activities going on at once. He is highly aware of his surroundings and when that is compromised he has a meltdown. He has two stigmatisms in his eyes and light sensitivities. Just hoping you could offer some suggestions on things to try. 🙂 Thanks for the article! Thanks for reading! Have you checked out my sensory processing resources page? There you can find very specific resources for auditory and light sensitivities. Wow, I’m sitting here reading this and going through the checklist and literally checking off everything on the Vestibular seeking side about my son. I’ll be calling his doctor to find an OT tomorrow! The part about the feeling like being a crap mom because you can’t control your child’s impulses… SPOT ON! Thanks for the great article! I’m definitely a new follower! On here and Instagram! Wonderful to have you! Don’t hesitate to reach out if you need anything! Please, oh please, check your grammar and spelling. You lose credibility (especially as a former educator!) with dozens of errors in what otherwise may have been a helpful post. I find this very interesting, though I am a mom, I can relate these things to me. I get sick on elevators and in cars. And I was recently checked by an ENT doc, who confirmed my vestibular system is all wacky (by doing an ENG –I believe is what it was called) and he recommended physical therapy. And when I already feel bad from activity I have a hard time coping with the noise my kids are making–they are 4 and 2 and very noisy. Hi, my son is vestibular seeking. He started rocking when he started sitting at six months and even doctors were like it is just to balance and it will cure but he is seven years old now and still has a habit of rocking. He is diagnosed with William Beuren syndrome. He also gets scared of car screeching sound and pressure cooker whistle sound. How can I help him? How can we stop the rocking or reduce it? Thank you so much for this article. My 5 year old daughter is a seeker and I have had such a hard time getting people/providers to understand what is going on. She has fallen out of chairs, gotten a concussion, spins in circles, hangs upside down, constantly fidgets, is extremely tactile, and put everything in her mouth. My ex, her father, thinks it is all me and I am making all this up and I am the problem.I have seen these behaviors for several years now and have continuously done the blame games on myself. No more! It is time for both her and myself to get help. That seems to present a problem in itself. My insurance doesn’t cover OT. We have a Development Pedi appointment at the end of May, which I have waited 4 months for and then I am going to try to deal straight up with insurance. I am glad that the awareness is finally coming out. Great article. The most helpful I’ve found in understanding SPD and vesitbular seeking behavior. For awhile now, I’ve been leaning towards the possibility of ADHD in my 5 year old daughter. However, the more I read about SPD, the more I believe this is the issue. How to know the difference? My 5 year old has always been movement seeking – running everywhere (never walking), spinning in crazy circles that would have made me sick, jumping off furniture, rough housing with her Dad, can’t sit down to eat, fidgets constantly, doesn’t like circle time at school, loves the park and fair rides, etc. Plus she shows some other SPD behavior related to touch, loud noises, and eating. Any tips on understanding the difference between ADHD and SPD? I have to say that this is very informative for me and I will definitely be looking into more information on this issue. My son is 5 years old and he started Kindergarten a little over a month ago. He is in trouble on a daily basis because he can’t sit still, walk in line with the other kids, spins around, etc. He exhibits nearly all of the vestibular seeking behaviors. They sit him in the back of the class, in the hall way, and make him sit on the side walk at recess due to his behavior. He’s obviously bored and not challenged enough by the work they are giving him. I think I will forward this to his teacher and get her opinion on it. Thanks! I like the vestibular chart you made and would like to include it in a newsletter I will be sending out shortly. Of course you will receive credit. Actually, since I am not trained, I prefer to give credit so people can check out the source for themselves. I found your article very helpful. Thanks for the way your organized it. Oh my goodness gracious! This helps explain my boy SOOO much! He is an ultimate seeker! Yaaaay! It’s not my fault! Thank you for being there to help us wade through this diagnosing part of our boys life xoxo ? My son definitely has vestibular-seeking tendencies. It has been apparent since he was 3. He did go through a round of OT years ago. He’s always running, hanging, spinning, always on the move. I loved reading this post. Your article touched my heart! I live this life as well. I am an early childhood educator too. My two year old is a sensory seeker. Attending Gymboree has been a life-changer for us. The gym is changed around every two weeks so she continues to have new challenges. It has been so helpful because it allows her to take risks in a safe (padded) environment. Before attending, she wouldn’t even let anyone other than my husband and daughter touch her. This included her OT. Ali would hold her breath until she passed out if she was upset. Gymboree has given her an opportunity to be in contact with others and allow touching. She spins, climbs, and rolls as much as she wants. She thrives on heavy work and Gymboree gives that to her.